According to new research published in the journal Behavioral Science & Policy Association, work stress damages our health just as much as exposure to secondhand cigarette smoke. The study, conducted by researchers from Harvard Business School in Boston, MA, analyzed 228 studies that looked at the effects of work stressors (e.g., job security, family-work conflict, long work hours, and job demands) on four health outcomes: mortality, the presence of a diagnosed medical condition, self-reported poor mental health, and self-reported poor physical health. Researchers discovered that workers who have high job demands are 50% more likely to develop a medical condition than those without this stressor. Job security was associated with a 50% higher risk of poor physical and mental health, and long work hours were linked to a 20% higher mortality risk. 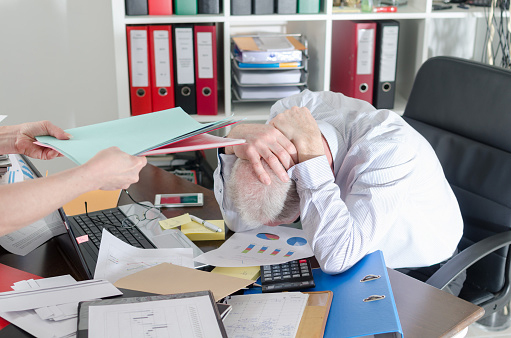 Study author Joel Goh suggests that policymakers need to address workplace practices that continue to contribute to job-related stress. According to the American Psychological Association’s (APA) latest “Stress in America” survey, money is the main cause of stress in the U.S., with work being a close second. Goh, J., et al., “Workplace stressors & health outcomes: health policy for the workplace,” Behavioral Science & Policy Association, published online September 2015; https://behavioralpolicy.org/article/workplace-stressors-health-outcomes/. Whiteman, H. “Work stress ‘damages health as much as secondhand smoke exposure’,” Medical News Today web site, September 7, 2015; http://www.medicalnewstoday.com/articles/299142.php.